Sep. 28, 2017 1:30 p.m. It was a somber day for members of the public and Remembering the Children Society as they remembered four Aboriginal students who died at the Red Deer Industrial School. Remembering the Children Society and members of the community, including students from some schools, gathered Thursday to participate in the unveiling of a stone memorial, acknowledging the previously unmarked graves of four Aboriginal students who died at the Red Deer Industrial School in 1918 due to the Spanish influenza. Hosted by the Society, the ceremony commenced with a pipe ceremony and ended with members of the community visiting the stone, paying their tributes and condolences. “When these children were discovered in the cemetery by the farmers’ field there, it was unknown where. There’s many children that it’s not known where they’re buried. These were the ones that the cemetery undertaker in Red Deer had heard about – the Spanish Flu that went through the community and took many of the students,” said Richard Lightning, president of Remembering the Children Society. The undertaker thought the students could be brought to Red Deer’s cemetery, which is where they now lay. Of those that passed away, four were identified, one of them being Lightning’s uncle, David Lightning. As one of the many speakers at the program said, the spirits have now been freed to go into the spirit world. “We want to create awareness with the general mainstream society because many don’t understand what this is all about, and I think this morning’s presentations were very eloquently said, the messages are getting across. I was very happy to see young urban students sitting there listening and they will learn, telling their experience with their parents,” said Richard. 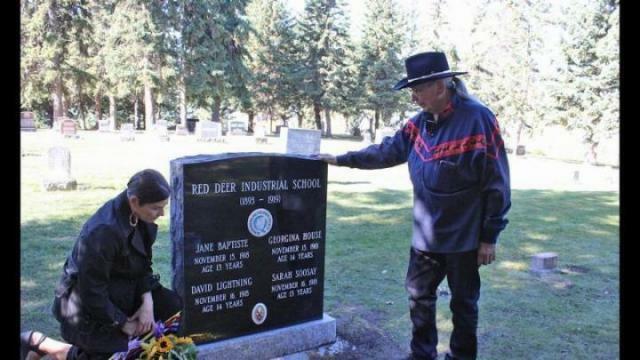 Richard himself was at a residential school for seven years, and had high emotions touching the grave of those lost. His daughter, Angie, was also emotional and tried to touch on the fact that a lot of parents never had a chance to see their kids, as they never returned home. Richard said a lot of parents still don’t know a whole lot about residential schools, and said there’s lots of work still ahead. The four students acknowledged include Jane Baptiste, David Lightning, Georgina House and Sarah Soosay. They passed away in the school’s dormitories. William Cardinal was another that passed away as a runaway from the school. His body was taken to his home in Saddle Lake.